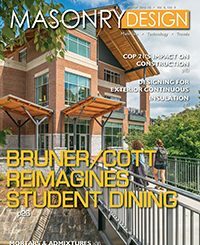 Bruner/Cott & Associates reimagines the University of Georgia’s student dining experience with Bolton Dining Commons. 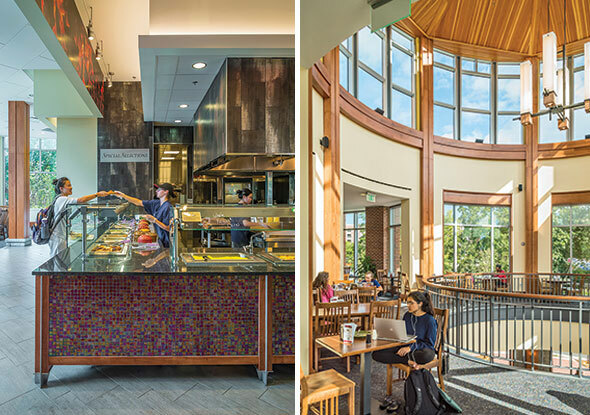 Today’s college and university dining halls are far from the banal cafeterias of yesteryear, serving bland and unhealthy food on plastic trays in windowless spaces. 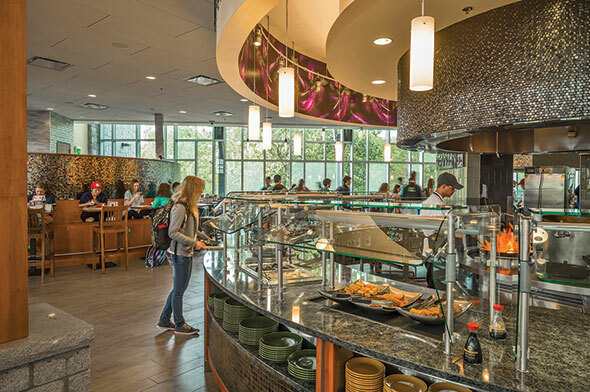 Just as schools compete to attract students by providing the best academic offerings, the coziest dorms, or the winningest sports teams, so too do these institutions increasingly seek competitive advantage by investing in restaurant-quality on-campus dining options, with a variety of fresh food served in inviting spaces where students want to linger. 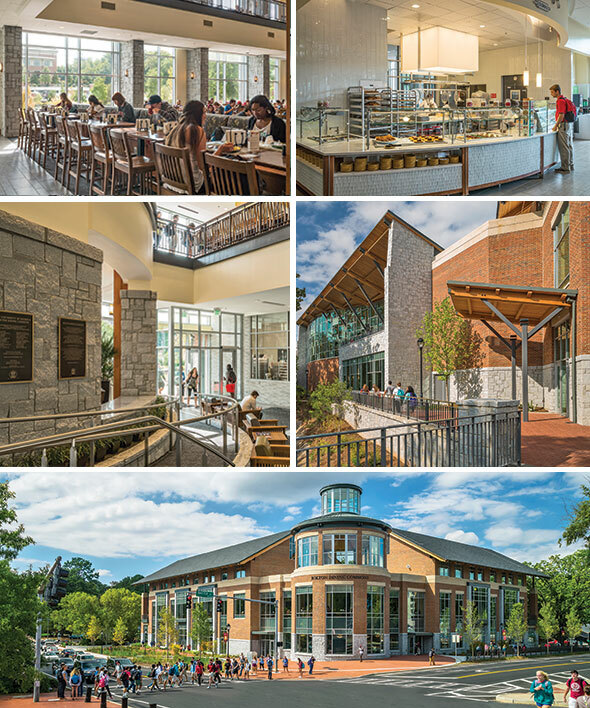 Enter the new Bolton Dining Commons at the University of Georgia (UGA), a $24-million dining hall by Bruner/Cott & Associates of Cambridge, Mass. (veteran of numerous award-winning college dining facilities), in association with Atlanta’s Smith Dalia Architects (with past experience at UGA). 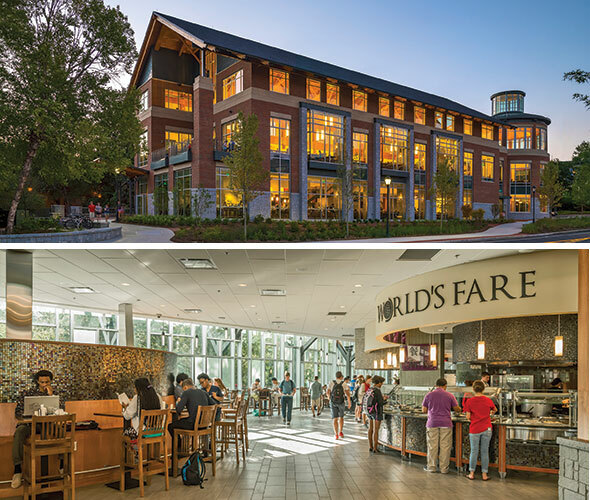 Replacing a worn-out facility on its prime site near the heart of the campus, the new 64,000-square-foot building is now the school’s largest dining commons, serving more than 10,000 meals a day. The facility includes more than 12 serving areas on two floors with spacious dining areas inside and out (plus approximately 4,000 square feet of offices and administrative space). It offers a variety of menu items from comfort food to international cuisine, with numerous vegetarian and allergen-free options, with small-batch cooking on display to promote freshness and healthy food practices. The building also includes a private, 200-seat dining space available to both university and student groups. Anticipating such daily demands, Bruner/Cott partnered with Smith Dalia to produce a cutting-edge design focused on four key design emphases: context, materials, space, and sustainability. Bruner/Cott envisioned the building as a symbol of openness, full of transparency and natural light, meant to strike an appropriate balance between the institutional grandness of its surroundings while seeking its own more casual identity. Fitting within a more than century-long tradition of existing campus buildings, its materials, scale, and proportions sought to be compatible with UGA’s architectural language—big and monumental enough to stand out in the small valley of its site, yet not so large as to overwhelm it—while also differentiating itself as something architecturally new and of its time. The building’s roof structure incorporates extensive timber decking to feel “softened and less institutional,” Simmons says. “We extended that to the eaves outside, which was a big step culturally for the Georgia vocabulary that the university embraced. At night, the whole building glows from the warmth of that wood. It’s not too grandiose and instructional to hang out in.” The timber, a combination of southern yellow pine and cedar, is FSC-certified. Although Bolton looks and feels impressively stately outside and warm inside, thanks to its material palette, a key feature of the building is its openness and transparency. 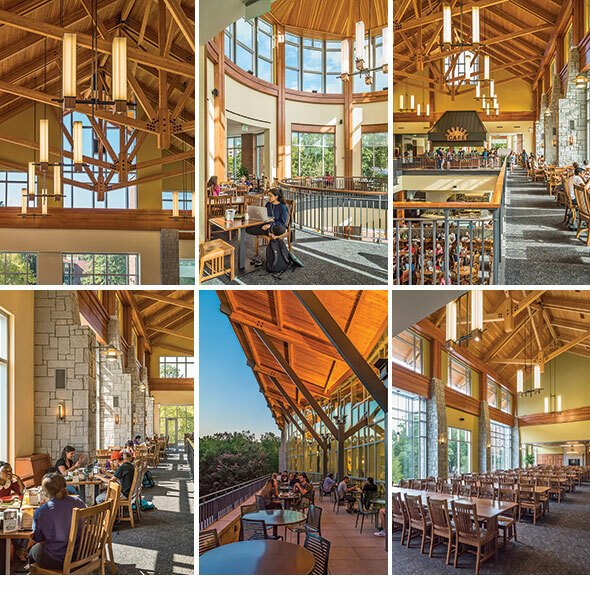 “The client saw the facility not just as a dining hall, but as a space to hang out in and a way to bring about quality of student life that was lacking at the old dining hall: a place to see and be seen,” Simmons explains. The hall’s interior is centered on a large atrium, allowing diners and servers on two floors to see each other and interact. The food service also is on display at the front of the house where diners can see their food being prepared. Service is split into a series of stations made distinct with different interior materials and signage signaling the type of meals served. The sense of openness also extends to copious natural light and to the views outside, provided by large window openings in the dining rooms. “We wanted to make sure that one’s experience in the building allowed 360-degree views,” Sniff says. A series of additional terraces provide the chance for outdoor dining during Georgia’s warm months, including a 45-degree version overlooking Tanyard Creek. A decade-long initiative to uncover and restore the creek to its natural form after generations under asphalt is currently underway. “A part of the creek has a concrete sea wall and riff-raff, so they’re looking to restore that to a more natural setting, as well as another creek that enters Tanyard Creek near our location,” says Smith Dalia Principal David Wallace. The terrace, a large curtain wall, an additional entrance, and pedestrian bridge connection anticipate the conclusion of the project. 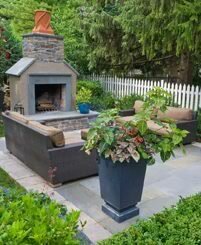 Reaching beyond aesthetics and functionality alone, Bolton’s design, construction, and ongoing operations are embodiments of today’s leading-edge sustainable thinking as well, expertise for which Bruner/Cott is well known. The building was conceived to meet the U.S. Green Building Council’s LEED rating program specifications, at or near its Gold level, but the client declined to pursue certification. Bolton’s primary structural and roof materials, steel and wood, are renewable resources. 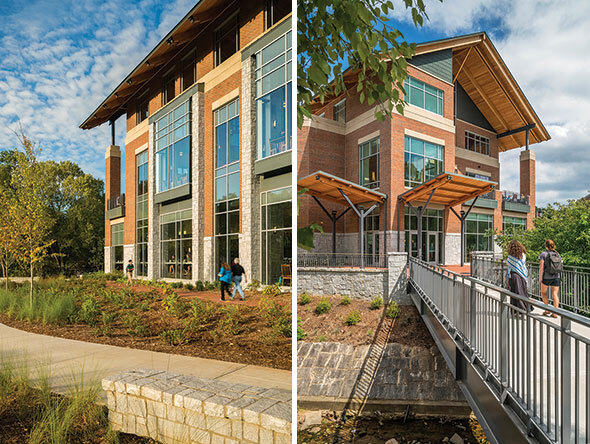 Measures such as low-e glass coatings and extensive overhangs combine with a tight thermal envelope, LED lighting, and robust insulation to make Bolton about 30 percent more energy-efficient than a conventionally designed building. The kitchen itself, often a use venue consuming large amounts of energy, also was made energy-efficient thanks to low-flow hoods that allowed reduced mechanical unit sizes, and also employs water-reducing plumbing. The construction sourced a majority of materials locally. The most distinctive among Bolton’s sustainable features may be how the dining hall treats its food scraps. A pulp extractor removes water from food waste and grinds the material into reusable compost for use in campus landscaping, thereby reducing waste by 90 percent. 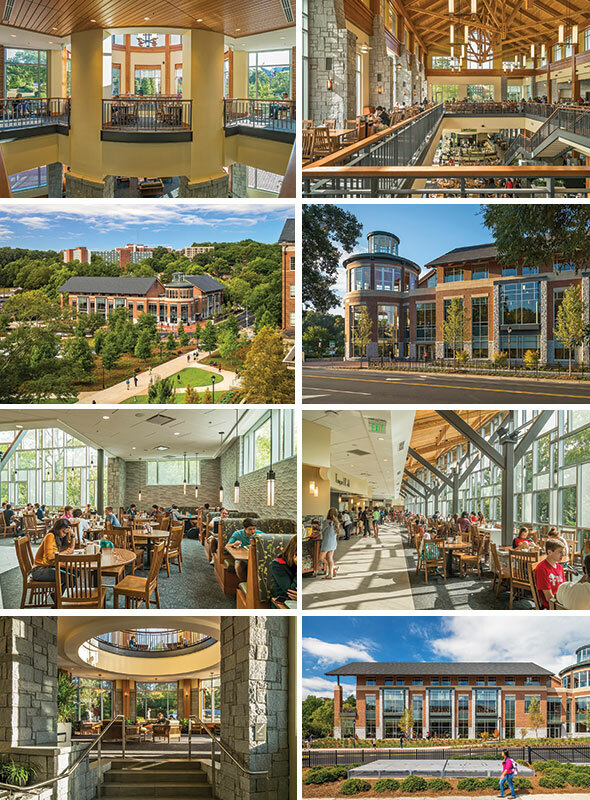 Bolton Dining Commons has proven to be more than an enjoyable place for students to gather and eat. It’s also a calling card for the University of Georgia. Heynssens + Grassman, Inc. has earned two “Excellence In Landscape” awards for recently completed residential projects on Chicago’s Northshore.